There is a general notion that there is a gap between the number of words that lower-income children hear compared with their higher income peers, and that this gap leads to a gap in early vocabulary and kindergarten readiness. But even more importantly, research shows us that the more parents meaningfully engage with their young children, the more their child’s brain will grow and develop. And that is an amazing opportunity. That’s where Too Small to Fail, a joint initiative of the Clinton Foundation and The Opportunity Institute, comes in. Their goal is to make early brain and language development a part of communities. And to do this, they’ve created the “Talking is Teaching: Talk, Read, Sing” campaign, which brings visually engaging and colorful signs to supermarkets, laundromats, bus stops and playgrounds to encourage talking, reading and singing between parents and young children. The signage is intended to provide families with reminders about the importance of engaging with their young children, as well as provide specific ideas for things to talk about. We’re proud to partner with Too Small to Fail on the “Talking is Teaching” campaign. By incorporating these interactive play panels, we’re meeting parents where they already are with their children and helping them boost their children’s early brain and language development through play. The panels are strategically positioned throughout the playground design so that children and their caregivers can sit near each other, and use the language prompts to interact with each other. 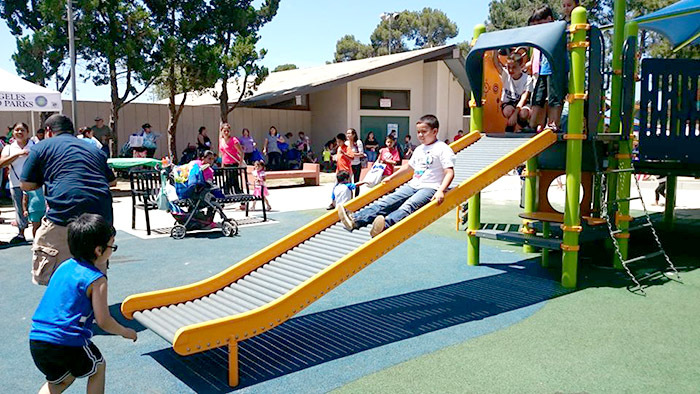 Even better, there is a seamless theme of play and education in these language-rich playground designs, so parents and caregivers are helping their children get ready for kindergarten and set them up for success in school. 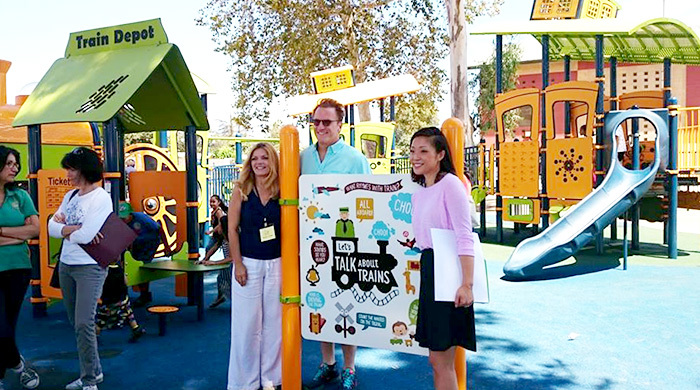 To date, Too Small to Fail has partnered with Landscape Structures to open 20 “Talking is Teaching: Talk, Read, Sing” themed playgrounds across the country. Learn more about our partnership with Too Small to Fail by contacting your local playground consultant.